Spanish airline, Vueling today announced it will be operating flights between Barcelona El Prat (Spain) and Eindhoven Airport as of April 2016. The announcement will mean another new operator serving Eindhoven Airport, with an extensive network across the Iberian Peninsula and the rest of Europe. The Eindhoven - Barcelona route will operate four times a week, on Mondays, Wednesdays, Fridays and Sundays in a modern and quiet Airbus A320 with 180 seats. The Barcelona route launches on Friday 29th April 2016. The route will operate year-round, with three weekly flights during the winter season. We are delighted with the announcement from Vueling – a strong brand with an extensive route network to both key business destinations and popular leisure ones. We hope that Barcelona represents the first of many in our relationship with Vueling going forward. Vueling is part of the IAG group (International Airlines Group SA), a British-Spanish multinational airline enterprise resulting from the merger of British Airways and Iberia in 2011. Vueling operates a fleet of almost 100 Airbus A320 and Airbus A321 aircraft, with another forty or so on order. Barcelona, one of the 75 potential destinations accessible from Eindhoven Airport, needs no introduction. Spain’s second largest city and the capital of Catalonia, Barcelona boasts stunning museums, monuments, parks and boulevards, making it one of Europe’s most visited cities. As the primary port in the Mediterranean, one of Spain’s main trading cities and the focal point of many international congresses and events, Barcelona also holds significant economic value. Vienna will soon be even easier to reach from Eindhoven. As of October 2019, the airline Laudamotion will fly from Eindhoven Airport to the Austrian capital four times a week. This will grow the network of capital cities that are frequently accessible from Eindhoven to over twenty. Wizz Air currently flies to Vienna twice a week. 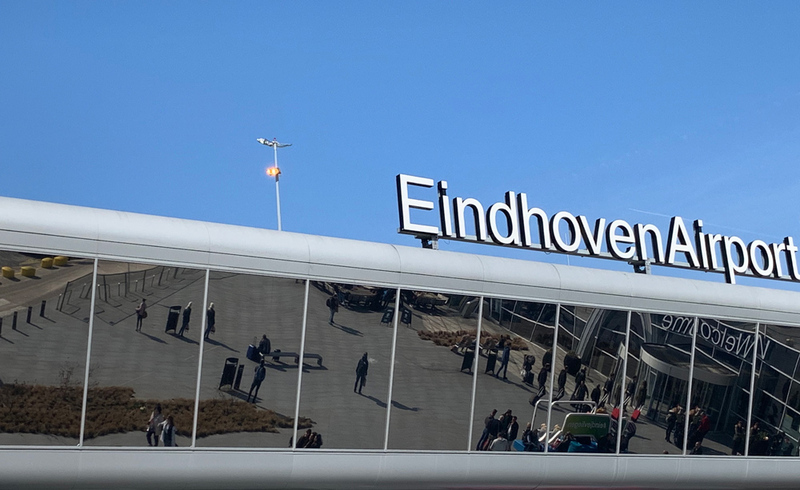 Eindhoven Airport is the second largest airport in the Netherlands with over 6 million passengers in 2018. The airport serves Brainport region and connects it with Europe and makes the region internationally accessible in balance with surroundings. The convenience for the passenger comes from the airport Álways Easy’ strategy. Flights depart from Eindhoven Airport to over 80 destinations. Speed and the total airport experience are its added values. With 2000 direct jobs the airport has grown into one of the region's largest employers. Business responsibility is part of our DNA. Continuously we pay attention to the balance between international connectivity, the environment, sustainability and the quality of live. The owners of Eindhoven Airport NV are the Schiphol Group, the province Noord-Brabant and Eindhoven city.